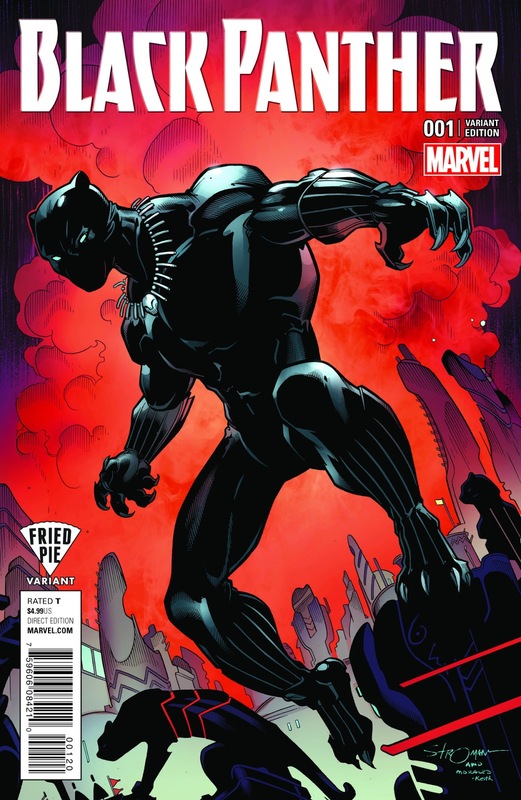 Artist Larry Stroman did the artwork for one cover for Black Panther #1 for Fried Pie Comics, a company that features "variant covers for popular comics by well-known industry artists." Stroman's image shows the Black Panther/T'Challa standing on the edge of a cliff. His claws are pronounced, and he seems poised for action. There is a smaller panther to the left and right below. In the distance are tall stones, and the background also includes red smoke, perhaps to signal an explosion. Stroman is a veteran comic book artist and one of a few African American artists, along with Brian Stelfreeze and Sanford Greene, to produce covers for Black Panther #1.